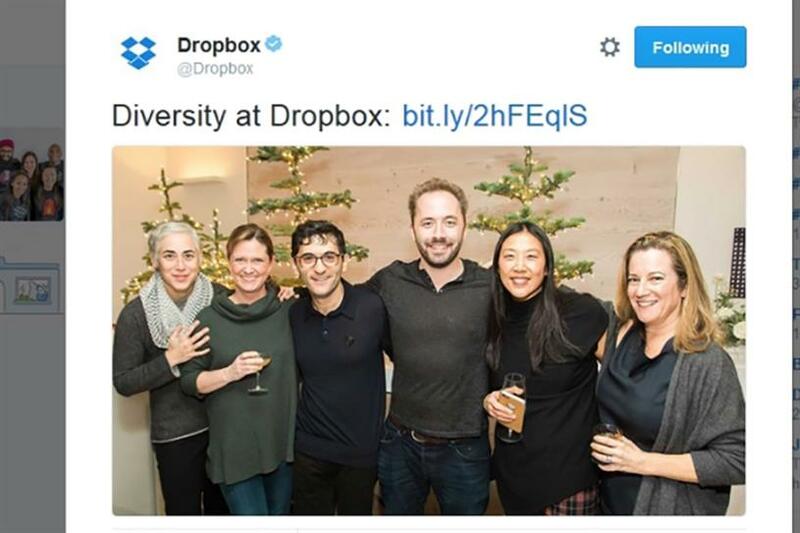 Included in the Dropbox tweet is a link to a blog post that does actually illustrate the company’s diversity efforts—in great detail. The blog explains that, this year, the file-hosting service has continued to invest in programs that help attract and retain diverse candidates. Out of the new hires this year, 35 percent are women—up from 28 percent last year; and 41 percent are from minority groups—up from 41 percent in 2015. Dropbox also lists key programs it has created to foster a diverse workforce. These figures and programs, however, took a backseat to the photo Dropbox included in the tweet, which was posted around 1 p.m. ET on Wednesday. Outrage ensued. "We're committed to building an inclusive workplace at Dropbox, and we know we still have a lot to do. Today we issued our annual diversity report that included a photo of our founders with some of our senior female executives," the company said in a statement late Wednesday. "This photo was meant to highlight the increase of women in senior leadership roles. We realize it doesn't fully represent the diverse workforce we strive for at Dropbox. Improving our diversity continues to be one of our top priorities in 2017 and beyond." However, comment after comment on the tweet questions the company’s decision to use that particular photo. Most Twitter users are making fun, but some are calling for Dropbox to fire its marketing team. Others are deleting their Dropbox app in response. Dropbox’s gaffe echoes Starbucks’ Race Together controversy last year. As part of that campaign, which invited customers to talk about race, the coffee chain used only white hands in related photos. This is yet another reminder that images matter—especially when communicating about a topic such as diversity. —This article first appeared in PR Week.